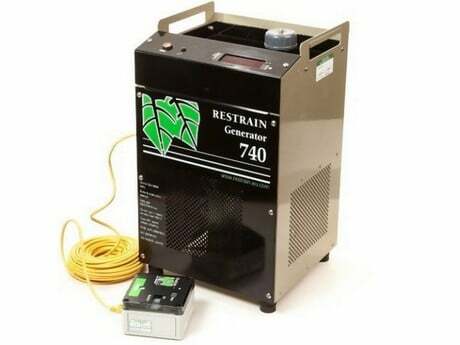 The British company Restrain has been developing ethylene generators since 2003, and they rent these to tomato, onion and potato growers throughout the season. The generators, equipped with technology developed in the Netherlands, are now sold in 36 countries. The operation of the system is relatively simple: the heat generated by the machine turns beet alcohol into ethylene. Ethylene is a natural plant hormone that is produced by all plants, but climacteric fruits in particular produce a lot of it.Although the gas synthesised by the machine can be used to accelerate the ripening process of tomatoes at the end of their cycle in greenhouses, it also delays the sprouting in tubers such as potatoes and onions. When onions are immediately placed in cold store after the harvest in September or October, the crops will remain good until the following July, without growers having to fear they’ll sprout. Regarding the onion market in France, demand is increasing for ethylene generators thanks to the increase in production volumes sold under ZRP labels. Adrien: “The ethylene we use is the only ethylene approved for using on onions. It’s therefore no surprise that more and more cold stores are equipped with our systems. Globally, about 300,000 tonnes of onions are processed per year.” The potato sector also offers development opportunities for the company. Right now, another, much-talked about, anti-sprouting product is on the market: ‘CIPC.’ However, it’s still uncertain whether ‘CIPC’ will be approved on a European level, and whether growers can continue to use it. “Our ethylene generator is a good alternative to this product. That’s why we’re doing so well among professionals from the fresh produce sector who anticipate a possible ban on this product,” Adrien concludes.